The FDA approved1 laser for reduction in stretch marks Viora Reaction combining fractional laser with the Viora Reaction Refit Process will not only remove stretch marks but also tighten excess skin. 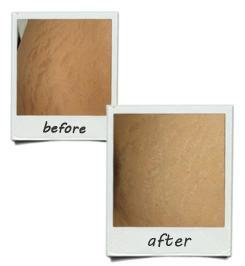 Stretch marks, also called striae, are a common problem, affecting a majority of women who have had children or lost weight, no matter how carefully they have watched their weight during pregnancy, and no matter how hard they have Viora Refit Before and After Worked to regain their shape and fitness after childbirth. Until now we have had no solution. Until now there were few options for stretch mark treatments. Since the U.S. Food and Drug Administration cleared fractional laser treatments for stretch marks last year, there now exists an excellent aesthetic solution to minimize the appearance of stretch marks with no downtime. Fractional laser coupled with Viora Reaction’s “Refit process” reduces the appearance of stretch marks, tightens skin and melts fat. The 1540 laser is one of the FDA approved laser treatments for stretch marks. The Lux1540 laser is a combination of high precision light beams that are able to penetrate deep through epidermis into dermis and distort the coagulated tissues of stretch marks. The body’s natural healing processes then take over, and stimulate cell growth resulting in the production of fibroblasts and new collagen. Overtime, white and red stretch marks begin to thicken, become narrower, and overall texture improves thanks to new collagen, and a new epidermis layer (the laser burns off a tiny layer of outer skin – epidermis). The skin covering our body consists of the outer surface that we see called the epidermis and a deep pink layer called the dermis. During pregnancy, the skin of the abdomen stretches to many times its normal size as the baby grows. During skin stretching, if the dermis expands too much or too fast, the dermis can break, split or rupture which cause a wide depressed scar which is called a stretch mark or striae. The use of steroid medications also causes striae even without tension or pulling on the skin. Very rapid growth spurts during adolescence or even in adults who are weight lifting and have rapid muscle expansion, can also cause rupture of the dermis and striae. The basic building block of the dermis is collagen which is the main ingredient in the dermis. Removal of stretch marks and striae requires building new collagen in the dermis to replace lost collagen. Tightening of the skin to brings the stretched skin back together. The body doea not produce new collagen without a healing mechanism at work. When the collagen in the dermis is heated to 66 degrees centigrade, the collagen shrinks and tightens, and the collagen is stimulated to remodel and grow new collagen. Heat produced by lasers, infrared energy and other forms of heat energy serve this purpose. This principle is the basis of skin rejuvenation, skin tightening, and wrinkle removal treatments. Examples are the Fraxel, 1540, Viora, SmoothShapes Fraxel repair, ActiveFX, DeepFX, Refirme, Thermage, Titan and Reaction refit technologies. The fractional erbium non-ablative laser 1540 beam goes deep into the dermis to heat the collagen to 66 degrees centigrade and promote the growth and production of new collagen to replace the collagen lost in the dermis in the stretch mark. The 1540 also causes collagen shortening which tightens skin. 1540 works down to about 1000 microns deep in the dermis. That is about half of the depth or thickness of the skin. Viora Refit is an RF frequency device which delivers heat to the very deepest layers of the dermis, deeper than the 1000 microns affected by the Starlux 1540. These deeper layers are where the elasticity of the dermis resides. Thus the Viora adds not only new dermal collagen production but also adds significant skin tightening. Both of these devices are called fractional because the heat is delivered into small partial areas of the skin instead of the entire skin surface. Because untreated areas of skin are left, the skin does not slough or peel, thus no skin is removed or ablated. Thus the term non-ablative laser and light treatment. These non-ablative treatments leave the skin intact so that no surface healing is required-no down time, unlike the old time laser resurfacing which required 2-3 weeks for skin healing. Topical anesthetic or numbing cream is applied to your skin before the 1540 treatment to make you more comfortable. Cold packs also are very helpful. These combined treatments take time. A lower abdomen can take an hour for the combined treatment. Larger areas can take longer. Once your treatment is over, your skin will be pink and warm, Typically no blistering, peeling or skin injury occurs Typically 5-6 treatments scheduled 3-4 weeks apart are required. You will see some improvement after a month. However new collagen production does not reach a peak for 3 months. It will be 6 months after your final treatment to see a final result. Remember, we are stimulating the dermis of your skin to repair and heal the dermis with new skin plumping collagen and skin tightening. It took 9 months to form the striae, so expect that it will take at least 6 months after your last treatment to see a good result and at least a year to see a full result. Depending on the severity of your striae, you may need more treatments to get continuing improvements and when done you may need yearly touch up treatments for the first year or two.